Desciption: Contains 3 types of Hyaluronic Acid that deeply penetrates the skin(epidermis) to nourish and help restore skin's barrier to prevent moisture loss. Nano Hyaluronic Acid - with molecules size of 1/20 of HA, easily penetrates into the skin innermost layer to deeply moisturize the skin. Super Hyaluronic Acid - with 2x the moisture retention capacity of HA to keep skin hydrated & smooth for a longer period of time. 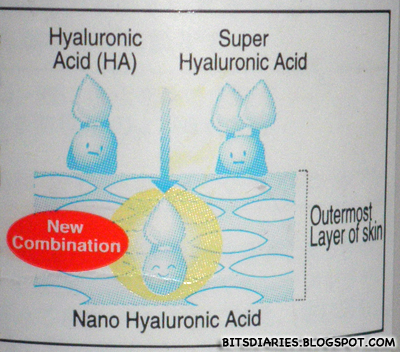 Hyaluronic Acid(HA) - 1gm is able to hold 6 litres of water, effectively locks-in moisture on skin. - Moisturizes deeply, offering nourishing hydration and skin-smoothing conditioners. - Skin becomes smoother, softer and richly hydrated, giving it a natural, healthy looking glow. 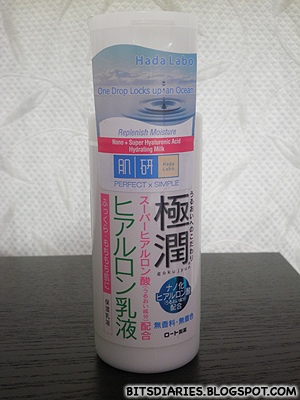 - It is free of fragrances, mineral oil, alcohol and colorant. Skin pH balanced. Low irritation. Directions: Use twice a day after the hydrating lotion. Apply on palms and gently pat onto skin until thoroughly absorbed. Close to watery but it's NOT very watery...It's a really light lotion. It's in white color but when you massage it onto your skin, it will become colorless. This lotion causes blackheads ? May i ask you how to know our skin type ? My skin sometimes oily but sometimes feel so dry and rough..made me confused to choose product .Can you recommend whats suitable for me ? Since you explained that your skin feel oily but sometimes dry, I guess you have oily & combination skin. You can look for products that are specifically for oily & combination skin. Well, different people have different skin types thus, individual results may vary. This product works fine for my oily, combination skin but I'm not sure if it would work out as good for you. If you have super oily skin, I would suggest to look for product that aids in sebum-control; specifically for oily skin.